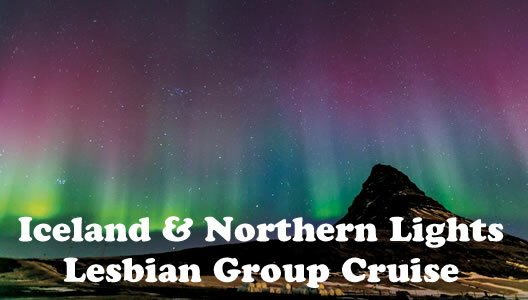 Take a breathtaking journey as we cruise to Iceland in search of one of nature's greatest wonders - The spectaular Aurora Borealis on Hosted Diva Lesbian Group Cruise. Embark on an exciting journey as we go in search of an amazing display of purple, blue, pink and green lights dancing across the dark Iceland skies. 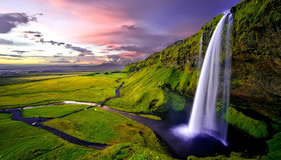 This truly is one of nature's greatest wonders which we hope to capture on hosted lesbian group cruise in October 2020. Our voyage takes us to Iceland, the "Land of Fire & Ice" where if atmospheric conditions are right we have the chance to witness the incredible and breathtaking Northern Lights. 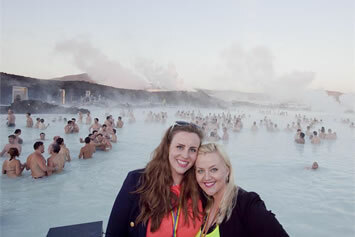 You will spend an evening and day in Iceland's capital Reykjavik where again you can explore some of nature's natural landscapes visit the Blue Lagoon, home to one of 25 wonders of the world, a place where geothermal seawater creates transformational spa journeys! An amazing display of purple, blue, pink and green light dancing across the dark sky of night, the spectacular Aurora Borealis is one of nature’s greatest wonders. This voyage takes you to Iceland, the ‘Land of Fire & Ice’ where, if atmospheric conditions are right, you have the chance to witness the incredible Northern Lights. 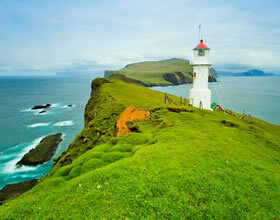 The Faroe and Orkney Islands are fascinating stepping stones on this spectacular voyage. So why not join Diva Destinations on our hosted group cruise to the Land of the Northern Lights. 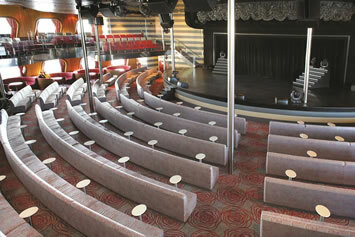 Your Diva Destinations representative will look after you from the moment you arrive to the moment you depart the ship. 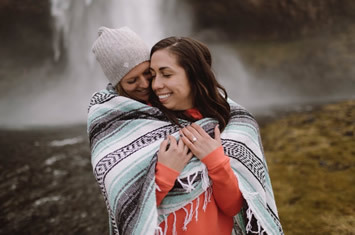 A holiday where gay women can meet new friends, share a fantastic cruise experience, have a wonderfully relaxing holiday whilst visiting some of the most breathtaking locations on our voyage to Iceland. Our group meet each day for meals; with evenings spent together at one of our hosted events followed by the ship’s entertainment programme, all at your disposal. 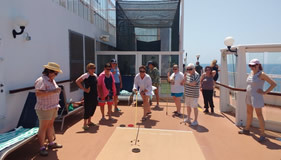 During the full days at sea you can join us for some fun activities on deck. 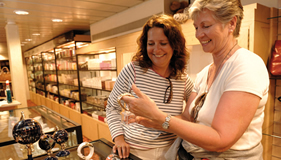 The remainder of your voyage will be taken up going ashore to explore the many sites on offer. A pub, a card room and a fully-stocked library are just a few examples of the many ways in which the Magellan cruise ship endeavours to make itself a home away from home for its 1,250 guests. Regardless of whether you are travelling, this beautiful vessel’s extensive facilities will always make you feel like you are in friendly and familiar surroundings once you get back on board. 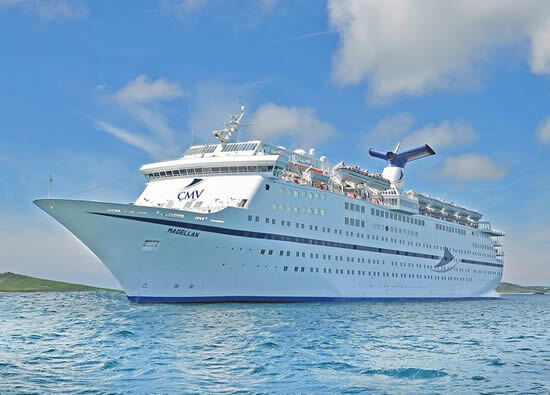 Combining expansive, comfortable surroundings and friendly service with stylish entertainment and delicious cuisine, the Magellan cruise ship is the perfect choice for those looking for a greater range of on- board facilities. However, she still retains a feel of intimacy and personal attention when compared with the 'mega' resort style ships built today. No climbing walls or ice-skating rinks and no kids! The Pool Deck lends itself particularly well to al fresco meals so a buffet breakfast or lunch from the Bistro can be served up with a complimentary ocean view! On a Cruise & Maritime Voyages holiday, our guests don’t need to wait until the sun goes down for the ship to come alive. Stroll around Magellan during the day and you will find all manner of exciting and relaxing activities to choose from, including beauty treatments, swimming and gym workouts. 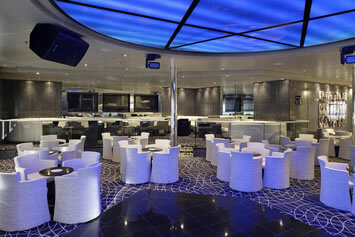 When it comes to after-dinner entertainment, you will be spoilt for choice on Magellan. As well as the traditional shows and cabaret you would expect to find on our ships, other evening entertainment options include classical music ensembles, card games and quizzes, along with performances by various specialty acts. 23 Oct A Day at Sea! 24 Oct A Day at Sea! 26 Oct A Day at Sea! 29 Oct A Day at Sea! 30 Oct A Day at Sea! 01 Nov A Day at Sea! Welcome to Bristol Cruise Terminal - the only cruise terminal in the UK that can connect you to all parts of the compass with excellent fast and easy motorway and rail access and unrivalled quality and varied excursions to be enjoyed within 90 minutes. 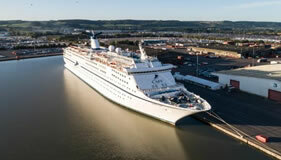 Bristol Cruise Terminal is the maritime gateway of the South West. The location is second to none with excellent, uncongested motorway and rail access directly at the Port. All cruise embarkation takes place at Avonmouth Docks with fast, easy access from the M4 and M5 Motorways, high security and on-site parking. 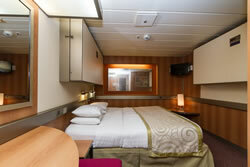 Bristol Temple Meads is 8 miles from the Cruise Terminal and Bristol Parkway is 10 miles away. Both are well connected and we recommend you take a taxi from the station asking for the Cruise Terminal. Lying at the mouth of the River Lee, Cobh has one of the best natural harbours in the world. Known as Queenstown until 1922, it was the departure point for thousands of Irish emigrants to America and the last port of call of the Titanic. The ‘Queenstown Story’ is a wonderful exhibition telling of this rich maritime history. From Cobh’s waterfront, streets lined with brightly coloured houses climb the steep slope of a hill, which is crowned with the imposing St Coleman’s Cathedral. 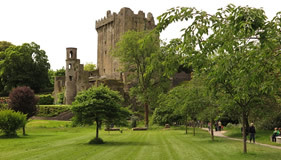 A charming little town, Cobh is a gateway to the city of Cork and excursions to Ireland’s legendary Blarney Castle. Days 3, 4 & 6 - A Day at Sea! 9am Your Diva Destinations representatives will meet you at breakfast. For those wanting a relaxing morning please feel free to join us later. We will be on deck sunbathing and organising some deck and pool games. It’s also a great time to chat and chill. 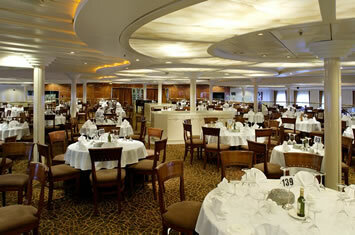 We will have lunch on board, please feel free to join the group. 8pm Meet for pre-dinner drinks in the bar for an 8.30pm Dinner. Join us after dinner and put your “Eggheads” heads on for our fun and “easy” group quiz. Play your joker and double your points – all general knowledge with a few curve balls thrown in. Plus a prize for the winning team. After the quiz we’ll go through excursion options for tomorrow and where and what time to meet. Once the site of an annual Viking gathering, Tórshavn is today one of the smallest and most pleasant capital cities in the world. 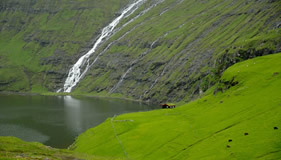 It sits on the southern tip of Streymoy, one of eighteen islands in the Faroese archipelago. Tinganes is the old part of the town where characteristic, red wooden buildings with turf-covered roofs cluster on a narrow peninsula. It juts into the natural harbour around which the modern town has been built. 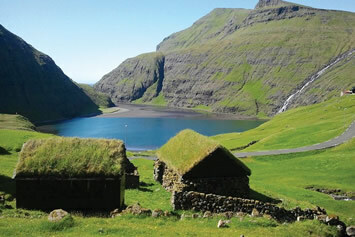 The Faroe Islands have a wild and dramatic landscape, which is a magnificent backdrop to optional excursions showing how islanders live on this remote and unspoiled archipelago. Part old Norse, part modern city, the Icelandic capital has a quirky character of its own. Although Reykjavik is one of the world’s smallest capital cities, it is home to almost half of Iceland’s population. Mosaics, murals and sculptures are found throughout the oldest part of the town where brightly coloured houses with tin roofs are watched over by the towering Hallgrimskirkja Church. 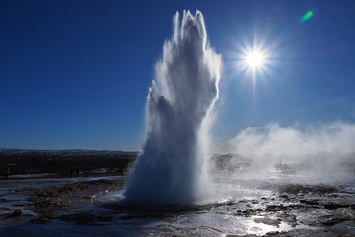 The classic ‘Golden Circle’ featuring vast lava fields, bubbling mud pools, crashing waterfalls and spouting geysers, is a popular optional excursion along with the chance to bathe in the famous geothermal Blue Lagoon. Days 9, 10 & 12 - A Day at Sea! 9am As we have a late start we will meet everyone a little later breakfast. For those wanting a late start we will meet you up on deck. We will spend the day relaxing by the pool with some deck and pool games organised throughout the day. 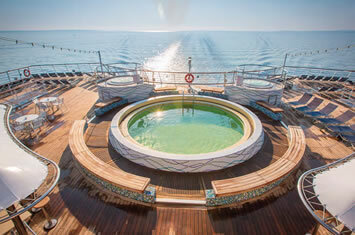 Or you might just want to kick back and relax on deck. 8pm Meet for pre-dinner drinks in the bar for dinner at 8.30pm. We will make our last evening a special occasion and will announce in the morning our plans for our farewell party tonight. Samson and Goliath are much-loved landmarks soaring above Belfast’s skyline. The two great, yellow-painted, gantry cranes are a reminder of the shipbuilding industry that put Northern Ireland’s capital firmly on the map. 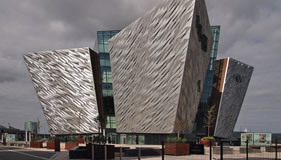 Housed in an iconic, state-of-the-art, 6-storey building, Titanic Belfast relives the city’s golden era and traces the story of the ill-fated liner built in the shipyards of Harland & Wolff. At the heart of today’s cosmopolitan city is Belfast’s elegant City Hall, which stands in Donegal Square. The extraordinary Giant’s Causeway is a popular excursion from this city with omnipresent Irish charm. There are direct motorway and rail links at the Bristol Port. The range of high quality day excursions available from Bristol is exceptional; Bristol itself has a fascinating history, Bath is close by and Stratford-upon-Avon, Oxford and Stonehenge are all within easy reach. There is a fabulous selection of sporting facilities in the area including three Championship golf courses at Ryder Cup venue Celtic Manor. 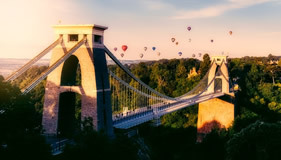 The Bristol Cruise Terminal is approximately 13 miles (25 minutes) drive by taxi from Bristol Airport, which is well connected both domestically and internationally. 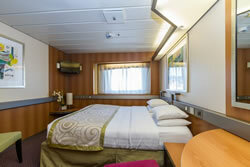 Taxes of €180pp, Gratuities of € 8 per person per day, and optional insurance are additional. 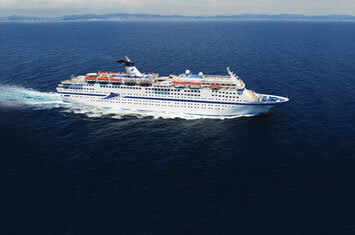 First deposit of €600 per person is required upon booking. Full payment is due 120 days prior to departure. Also included are the traditional Diva Destinations activities, subject to minimum participation. Web Page © Happy Travel, Ltd. Logos and Images © Olivia, Diva Destinations, etc.